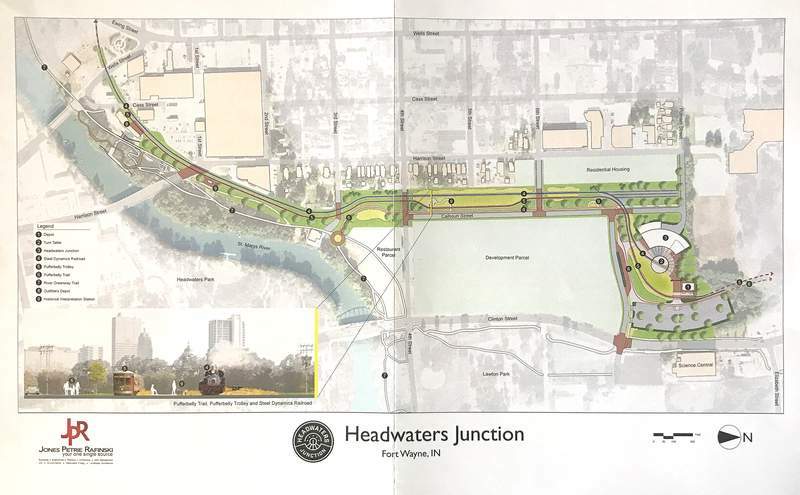 Courtesy A map shows how the planned Headwaters Junction project will look and operate as part of a proposal for the North River property. The commission's ownership might make it easier and less costly to acquire the land at some point if the plans are approved, he said. Continental's proposal for North River has been put “on pause,” said Mary Tyndall, the city's community development spokeswoman. The land has been woven into a pending report from the city's riverfront development consultant, David Rubin Land Collective of Philadelphia, she said. Nancy Townsend, the city's redevelopment director, said the city likely is “not going forward” on awarding Continental's proposal for North River. “The reason (for the announcement of the right-of-way acquisition) is to prove to David Rubin and the city that we have the connector. Until we have this, we don't feel like we can go after any (additional) money” for other aspects of the project, he said. He said the attraction will run more than just the Fort Wayne Railroad Historical Society's locomotive No. 765 on the track, dubbed the Steel Dynamics Railroad. Built in 1944, the gleaming black behemoth is one of only five restored mainline steam locomotives still in operation on the continent, Lynch said. The fundraising brochure lists 18 proposed events built around holidays and the engines – from a Valentine's Day train in February to A Day out with Thomas in August and the railway society's already-popular Santa Train in December. “It's not operating four times a day. It will be weekends and traveling at 10 miles an hour as a (seasonal) tourist railroad,” he said. “There's nothing we have to tear down or move out of the way to put the railroad back in where it used to be,” he said. Tyndall said Land Collective's report is expected by late summer or early fall. Consultants are now working on the second and third phases of the riverfront, including a master plan for surrounding neighborhoods and strategies on how to connect people to riverfront attractions, she said.